UPdate: MicroFantasy is Our Partner! UPshow is pleased to announce our exciting partnership with MicroFantasy! MicroFantasy is the leader in real-time predictive fantasy sports, transforming the sports viewing experience in bars and restaurants with live prediction contests for baseball, football, basketball, and more. 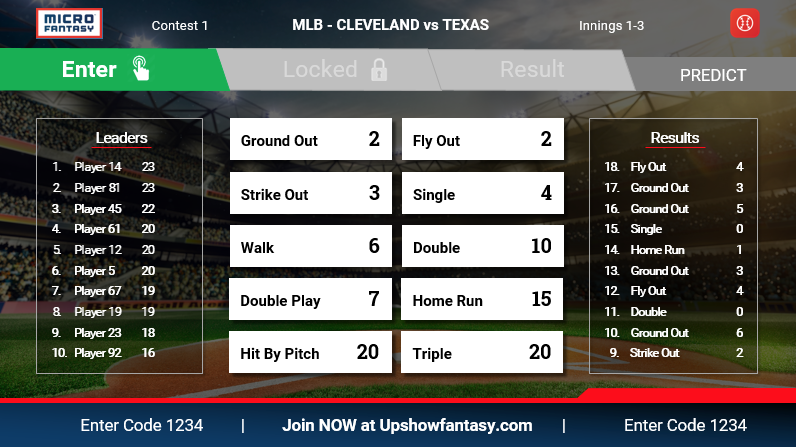 MicroFantasy’s integration into the UPshow platform will allow for the MicroFantasy experience to appear on UPshow TVs during a live sporting event, prompting guests to join in the game. From there, they simply use their phone to go to the website listed on screen, type in their name, and begin playing. Each participant predicts the result of the next play. Correct predictions receive the number of points listed next to each option. Results are displayed on the leaderboard, and the participant with the most points at the end is declared MicroFantasy Champion. The winner is then directed to an employee to receive their prize. By hosting competitive games that further engage fans as they watch at venues, business owners will be able to increase the time each guest spends in their venue, build customer loyalty through rewards, and make the game-time experience something special. We are always looking for ways to maximize the ways in which venues can create a great UPshow experience, and are looking forward to seeing MicroFantasy content on our screens! Want Social TV that features MicroFantasy? Call us at 855-7-UPSHOW or email Tom Fluegel at tom@upshow.tv (Current customers - contact your UPshow account manager).